Boy did I have a rough few weeks. One thing after another went wrong. I got to the point where I just wanted to shut the world out for a bit. How did I do that? I pulled out a book and sat down to read. This is the part where you Christian writers have a huge impact on readers. I found encouragement and strength in several books that pointed me to Christ, and gave me the edification I needed to keep going. It’s amazing how much we can glean and take with us through the week from even a Christian fictional work. Carrie does a great job showing life on a plantation during the Civil War. She also opened my eyes to a little known fact. Her story revolved around a slave who was 1/8 African yet looked white and her niece and nephew who also appeared to be white but were slaves. Kate does an exquisite job relaying the miracles of Jesus from the perspective of the people who received them. I loved how she dug into their lives and personal history to show why they needed a touch from the Savior. Diane’s novel was a fun story about a woman who ventures out to find her own way in the Midwest. Although she didn’t stick to the traditional view of the nineteenth century, I was encouraged by her message of the importance of looking on the inner man and not the outer one. Christa’s novel really made me think. She wrote in deep point of view about addiction and breaking the cycle through her main character. I was inspired by her style of writing. Her voice is very unique and I can’t wait to find more books written by her. If you haven’t had a chance to read any of these, take the time to get your hands on them. You’ll be encouraged and uplifted by the message God gave these writers. Thanks so much for letting me know about your blog post, ERIN!!! I am so glad my story inspired you this past week! Since Return to Shirley Plantation has been published, two of my close friends told me that they had discovered that they have African ancestry! I'd not have thought so for either. It simply isn't discussed, either! But this was a huge point the abolitionists used during the Civil War. Blessings! It looks like you have read some great books, Erin! I have only read Carrie's and that was a great read indeed! Carrie's story was indeed inspiring and although I haven't read the others I have heard good things about them! So nice to meet you here, Erin! You are so right about good books helping you through hard times! I was in the ER with my hubby Sunday night and reading Roseanna White's newest, and it really helped me not panic as they tested my hubby for cardiac issues. Thank God, he was fine, but that book really helped me focus on something other than my personal panic in the moment! I read Carrie's beautiful novella, and it was wonderful. I learned things, too, and I am a lifelong Civil War buff. Terrific blog post! The other books sound terrific, too. I think that's wonderful that Carrie and her story has inspired you Erin! She inspires me also!! And more times than I can count, books have taken me through rough times also. Praise the Lord for authors! Btw, I love the look of your blog! What a great post ERIN! It is so true that reading a good book can help you through the bad times! All of these books sound truly amazing but I have to say I am partial to Carrie's! 🙂 It is a beautiful story and so inspiring. Thanks for sharing this with us! Isn't that interesting about your friends. It's always fun to find out something about our family history, isn't it? It helps us understand who we are. And they were so diverse in theme and voice. Thanks for checking out my blog! She is, isn't she? I have been blessed by knowing her. 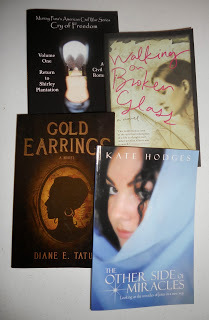 When I went to the writers' conference in Philly, I got my hands on some amazing books and met the authors. It was a great way to get to know some new writers and their work. I'm going to incorporate these in my monthly book reviews. I never go anywhere without a book if I can help it. It really does make the time pass during long doctor visits. Glad your husband was okay. I'll keep him in my prayers. Thanks Noela. I'm so thankful also for all the Christian writers who stick it out through hard times in the publishing world to bring us stories that uplift and encourage us. Thanks Teresa for following me! 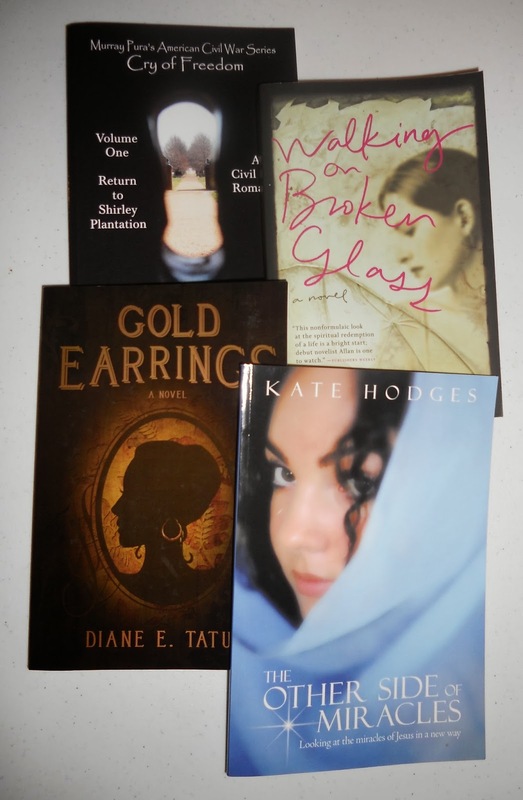 Three of the four books I featured were from new authors. I love to encourage new writers. Nice to meet you too Diana. Thanks for stopping in to read my post. Are you a writer too? Thanks for the glowing review! I am trying to make myself buckle down and get working on my next book. I have yet to read the others but am looking forward to it. So sorry for the delay in thanking you for this mention of my novel. I'm humbled by your kind words, and I'm so touched that Leah's voice and journey resonated for you. Marian, your sweet story blessed me and will bless so many other readers! Thanks so much! Erin is a real sweetie, Diana! Erin, Diana is our Senior Reviewer on the blog but I keep telling her that one day she will be writing fiction–she doesn't believe me, though! Ohhhhh, you girls just made my day, maybe my week. I feel so uplifted!!! XOXOXO to both of you! Oh that is neat–it didn't sink in with me that you went up to the Philly conference, Erin! I'm glad those authors were able to bless you! My word for this year has been “Continue” because last December I was feeling like letting a lot of writing stuff go, but God convicted me. Noela and Erin thank you for blessing me! Erin, what you are doing is a ministry to the new authors! Teresa–you are such a doll and a beautiful poetess!!! I just finished manuscript number 4 on Saturday. You can imagine the jumping and praising that was going on in this house. Thanks so much Christa. I have a manuscript out on circulation to agents(still working on getting one) about a young woman who goes to rehab. It's very different from yours, but I was very encouraged to see that my ideas fit with the rehab environment in your book. I can't wait to get my hands on some of your other books. You're the one that's been a blessing to me. Keep going Carrie. I want to read more of your work. Is that for Colonial Quills? Is that the blog you are a part of Carrie?